Bridal shower bingo needs to be part of the mix if you want your bridal party to be as fun as possible! The fun comes in all shapes and sizes. Definite must include refreshments, food, music, and fun wedding games to keep guests laughing! Your besties gather to celebrate your friendship and your happily ever after, and they certainly want to have a good time doing it. Games and activities make a world of difference. 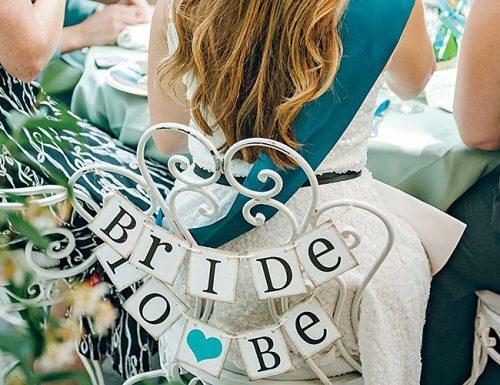 A great party involves up to 10 wedding shower games and bridal bingo is at the top of our list! 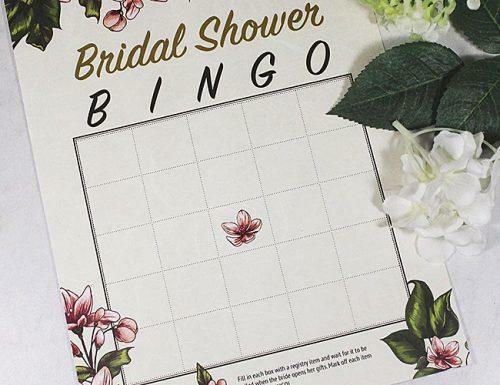 Click through these pages and we’ll show you exactly how the game works and provide you with a free bridal bingo template! Wedding shower bingo is fun and it’s easy! The center square is free! Have your guests fill this in with the gift they brought. They’ll have to earn the rest of the squares. Fill each one out with questions that only your close bridal party will know the answers to. Fun examples include “The Bride’s College Roommate”, “Unhealthy obsession with shoes”, or “Where the newlyweds are going for their honeymoon”. Each player writes down their answers. Then, the host reads the answers out loud as players mark the ones they got correct. Markers can be as simple as a penciled in checkmark or you can get creative by providing stamps, stickers, or ornamental markers. Whoever gets the most questions right, wins! A variation of this game also starts with placing your name and the gift you brought in the center of the board. Rather than having the bride or host fill out the rest of the square with questions, the squares are filled with a list of all of the gifts. Each player takes a guess at which guest brought what gift. Once everyone is done filling in their guesses, each guest announces out loud what they brought. Again, each player marks off each time they were right. The player with the best guesses wins! Bridal Bingo is a great game to break the ice. It doesn’t take a long time to set up – thanks to our handy printable cards – and takes very little thought to play. As long as you get the questions right, your whole party will have a great time with this game. Using inside jokes and making the questions about your guests makes it personal. This causes people to reminisce and laugh at the good old days. If some of your guests aren’t familiar with each other, this game is a great introduction. Swap out questions about the bride and groom and replace them with trivia about the guests. Your party will have a great time guessing which clue matches their new friends. Either way, It gets your guests talking, and who doesn’t love to scream “Bingo!”? Although many of the modern variations are a little more popular these days, many brides prefer the traditional version. This is played like normal Bingo. You can replace the word “Bingo” with the word “Bride”. Players only need to complete a single horizontal, vertical, or diagonal line to win the game. Each square can contain a number, or, each square can contain facts about the bride and groom. In both cases, the host shouts the numbers or facts until a player wins! Your guests will have tons of fun with the classic version. Winning is purely up to chance, so there’s no need to worry about the maid of honor winning every time because she happens to know the most about the couple or the other guests. Everyone has a fair chance of winning and guaranteed fun! Making the cards is ridiculously simple, just print out the free templates we’re providing! Once printed, randomly fill out the squares with numbers are the questions or facts of your choosing. Remember to print a second set of facts and numbers for the host to draw from a hat and read out loud as the game moves along. You can always make your own version of this game. The important thing is to have fun! Starting off your night with this social game is a surefire way to get the party started on the right foot. 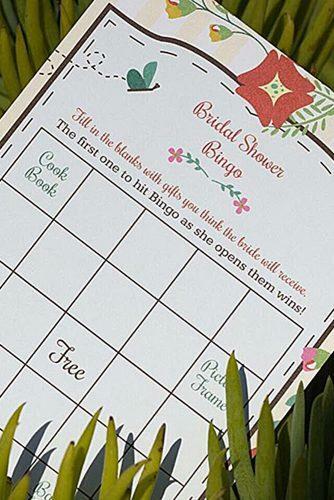 Printing the Bridal Bingo cards is a great start, but many brides may want to customize. If you have editing software, feel free to add a romantic quote, some personal images, or the date of the wedding. It doesn’t stop there. Supply your guests with custom stickers or small wedding favors to use as markers for the game. Jazzing up the game with personalized items will set the tone for the rest of the night. Check in often for more great helpful tips on how to plan an inexpensive bachelor party, wedding checklists, and the trendiest fashions.